Here I have compiled a list of Hong Kong travel tips for anyone travelling to Hong Kong. These travel tips are categorized into different themes (shopping, dining, transportation) to make it easier to find what you’re looking for. I hope you’ll find some useful information that you can use on your trip. Obviously there’s no way I could list all possible Hong Kong travel tips. This subject is very broad and there’s always something new that could be added in. If you can think of any Hong Kong travel tips not on my list that would be useful information for others, please contact us with your tip and I’ll add it to the list. Please note that Hong Kong Trip Guide reserves the right to accept or reject any Hong Kong travel tips submitted. – Plastic bags cost $0.50 HKD each in stores. This is to encourage customers to bring their own re-usable bags. There are some exceptions. When you buy something from an expensive store, or sometimes department stores, you’ll get a bag at no cost. – Alcohol is very expensive in Hong Kong. Beer is the only alcoholic drink more reasonably priced in Hong Kong. – Alcohol is sold everywhere from liquor stores to grocery stores and convenience stores. Most of the time store clerks don’t ask for ID to prove you’re 18 or older. If you’re travelling with someone under 18, you may want to keep an eye on what drinks they buy. – The Octopus Card is accepted almost everywhere in Hong Kong. You can get one at any MTR or KCR customer service centre (except the racecourse station). You must pay a $50 deposit to get an Octopus Card. The deposit is refunded when you return the card. An extra $100 is added to an adult card and an extra $20 is added to a child or senior card so that you have a beginning balance on the Octopus Card. – If you plan to buy an expensive item in Hong Kong, make your purchase at a department store or a specialty store that only sells that specific brand. Otherwise you can never be 100% sure if what you’re buying is real or fake. – There are stores that have a “Golden Q” with a Chinese symbol in the middle placed in their window. This award is given to businesses from the Hong Kong Tourism Board under the Quality Tourism Services Scheme. These businesses have been inspected to ensure they have a certain standard of quality. Some of the criteria includes: clear information, easily visible prices, and good customer service. You can shop at these businesses with confidence. – Items inside Hong Kong Convenience Stores are sometimes cheaper than they are in supermarkets and other stores. – A lot of malls in Hong Kong have express escalators that skip 2, 3, or 4 floors. Make sure you check the escalator before you get on. Otherwise you might skip the floor you wanted to visit. – Some smaller malls, like the 298 Computer Zone, have markings on the floor to show you where the exit is. So if you ever get lost in a crowd in a smaller mall, just look at the floor for exit arrows or foot print stickers showing which route to take to get out. – Malls and Hotels sometimes have a Ground Floor and a 1st Floor. So don’t always think the 1st floor is the ground floor and get off the elevator 1 floor too soon. – If you go to a small specialty mall (like Oriental 188 Shopping Centre or Wan Chai Computer Centre) or a specialty market (like the Goldfish Market or Ladies’ Market), shop around before buying anything. You may find the same item in a different shop for a lower price. Just remember where the store with the cheapest price is located! – Clothing in Hong Kong is usually about 1 size smaller than the size you buy in your home country. For example if you wear an American Medium sized T-Shirt, you need to buy a Hong Kong Large sized T-Shirt. – A lot of women’s clothing in Hong Kong comes in 1 size only. This size is approximately a Wetsern size 4. This size is known as a 1 size fits all. – Hong Kong is one of the best cities in the world for dining. The food is cheap and tastes very good. You can find almost any kind of cuisine in the world here. For more information on traditional Hong Kong food, click here. – Most restaurants will have a Chinese menu and an English menu. If there’s no English menu, they’ll have pictures next to some items on their menu. So you can still order something if you’re feeling adventurous. – Portions of food and drinks in Hong Kong are smaller than what you may be used to. – Tipping is not expected anywhere in Hong Kong. At restaurants you can leave a little bit of change if you like, but it’s not mandatory. Taxi drivers will usually round up the fare to the nearest dollar and won’t expect a tip. – Fountain drinks at fast food restaurants are very small and filled more than half way with ice. If you ask for no ice, they may give you less or charge you more to fill the drink to the top. – A trip to Hong Kong is not complete without trying some Hong Kong street food. This type of food is very popular in Hong Kong. -Washrooms aren’t always in restaurants. There may be 1 set of washrooms on each floor of a building that are shared between all stores/restaurants on each floor. Sometimes you may even have to find a specific floor with washrooms on it. So if you have to go, you may have to walk for a long time to find a washroom. – It’s quite common to go into a washroom and see toilets with no seat. There’s just a hole in the ground. You can try to use these toilets if you really need to go. Sometimes the handicapped stall has a western style toilet (one with a seat). Look for a washroom in a department store or a mall with expensive stores inside. There’s a much higher chance of finding a western style toilet in these places. – A lot of public washrooms don’t have paper towels to dry your hands. Sometimes you may not even be provided with toilet paper! I suggest keeping at least 1 set of napkins with you at all times in Hong Kong just in case. And check the stall for toilet paper before you do your business. The best public washrooms to use are the ones inside a mall with expensive stores or department stores. They’ll almost always have everything you need inside. – No littering is allowed in Hong Kong. This includes spitting. If you’re caught littering or spitting in public, the police will fine you (any amount up to $1500 HKD). – No smoking in public areas. Maximum fine for smoking in a non-smoking area is $5000 HKD. – You must be at least 18 years old to enter the Happy Valley Racecourse or the Sha Tin Racecourse. This is because gambling occurs at the horse racing racecourses. A lot of Hong Kong hotels offer babysitting services. If you want to visit a racecourse but have someone under 18 with you, you could leave them with a babysitter for a few hours while you go out to see the races. – You must be 18 years of age to drink alcoholic drinks in Hong Kong. – There is no law in Hong Kong against walking around in public with open alcohol. Just remember that even though you can drink alcohol in public, you can still be fined by police officers or refused entry on public transportation for public intoxication. So if you’re drunk in public, just don’t cause any trouble and you’ll be fine. – It’s required by law for passengers in a vehicle to wear a seatbelt. If you don’t wear a seatbelt in a taxi, they can refuse to drive you where you want to go. – The Tram is the cheapest form of public transportation in Hong Kong. It’s ideal for travelling shorter distances that would take a long time to walk. Travelling long distances takes too long by Tram due to the frequent number of stops along the Tram routes. MTR is much faster. The Tram is only available on Hong Kong Island. – The MTR is the most convenient form of transportation in Hong Kong. It goes to most popular places in the city. – Taxis come in 3 different colours: red, blue, and green. Red taxis can go anywhere except Lantau Island and are usually found in downtown Hong Kong. Blue taxis are for Lantau Island only. Green taxis serve every area of the New Territories. If you get in a green taxi in the New Territories and you want to go to Kowloon, you’ll be taken to a taxi station where you’ll have to transfer to a red taxi for the remainder of the trip. If you’re unsure about which taxi to take, just take a red taxi. – Tipping is not expected anywhere in Hong Kong. Taxi drivers will usually round up the fare to the nearest dollar and won’t expect a tip. At restaurants you can leave a little bit of change if you like, but it’s not mandatory. – Keep in mind if you travel through a tunnel on any form of transportation you’ll have to pay more. This is because of tolls for travelling through a tunnel. – The busiest times of the day for public transportation are around 7:00 am to 9:30 am and from 5:00 pm to 7:00 pm. All forms of public transportation get very packed with people and you may have to wait for several trains/buses/trams to go by before you actually get on one. – If you need to be somewhere during the public transit rush hours, I’d recommend planning to be in that part of Hong Kong before rush hour starts. The other option is to plan your departure an hour or two earlier than you need to be there. Trust me, you’ll need the extra time. I’ve had instances where I gave myself an hour to get somewhere and couldn’t even get on any vehicle during rush hour. Buses and the MTR were packed and had huge lines of people waiting to get on. I thought a taxi would be faster, but so did everybody else and the line to get on a taxi was just as long. I hated the feeling of being stuck where I was with no options but to wait in a huge line to get on any form of public transit. So spend your day close to your other destinations where walking is actually an option and could be the fastest way to get there. – Most public transportation isn’t made for tall people. I’m 6 foot 1 inch tall and my head touches the roof of buses and trams. I have to duck most of the time. The top level of buses and trams are shorter than the main level. Seats don’t have much leg room either. My legs don’t fit in the seats so I have to turn my legs into the aisle when I sit down. The MTR is high enough for me to stand without ducking and the seats have enough leg room. – Renting a car in Hong Kong is not as great of an idea as you may think. The streets are very busy with cars and pedestrians. Parking is very difficult to find. Parking stalls are very small and require a lot of skill to park. – If you go walking around the streets of Tsimshatsui, watch out for East Indian people dressed in suits. They’ll try to sell you custom tailored suits or Rolex watches. This is fine if you want to buy one, but can get annoying very quickly if you don’t want to buy one and you see them on every street. Some of them can be very obnoxious and aggressive. I’ve seen them grab people walking down the street. I even saw 2 of these people walk in front of someone, grab that person, and block him from walking away. – A couple times I saw a man walking along the street dressed as a monk. He came up to me, hit a gold coloured bowl with a small metal stick, said “hello” and put the bowl in front of me. His bowl had money in it so I knew he wanted money from me. Real monks would never beg for money like this. These guys seem to only target people who look like tourists (basically white people), say the only English word they know, and hope to get money because tourists won’t know he’s a fraud. – The busiest day of the week in Hong Kong is on Sundays. This is because Sunday is the only day of the week that most people, including all Philippino maids, have the day off. Big crowds of Phillipino people go out on Sunday with their friends and family. – The best time of year to visit Hong Kong is anytime between the late fall and early spring (November to March). The weather is dry and a little cool at this time of year. If you go to Hong Kong any other time of year, the weather will most likely be very hot, and humid. There will be a lot of rainy days as well. There’s also a chance Hong Kong will be hit with a typhoon anytime between May and November, with September being the worst month for typhoons. – Most places are shut down during a typhoon and everyone goes home for the day. If you need something during a typhoon, you may find a convenience store open somewhere nearby. – The busiest time of year in Hong Kong is around Christmas time (most of Dec) and Chinese New Year (sometime between late Jan to early Feb). All flights to Hong Kong are usually full and plane tickets can get very expensive. Hotels become very expensive with very little vacancy at this time of year. – If you plan on visiting Hong Kong Disneyland or Ma Wan Park – Noah’s Ark, go to the Avenue of the Stars first. There are gift shops along the Avenue of the Stars that sell tickets to either of these attractions at a lower price. – Look for special kiosks all around the city called an MTR Fare Saver. If you see one of these, scan your Octopus Card on the Octopus Card scanner and you’ll save up to $2 on your next trip on the MTR. The MTR Fare Saver should specify which MTR Station(s) the discount will apply at and how long you have before the discount goes away. This Discount only works with the Adult Octopus Card. – Phone plans are very cheap in Hong Kong. Hotels offer cell phone rentals and you can prepay for the phone calls you’ll make in Hong Kong. – If you bring your cell phone with you to Hong Kong, take the SIM card out of it and don’t use it as a phone or for data. The charges for roaming in Hong Kong are very high. – SIM cards from Hong Kong won’t work in iPhones from other parts of the world. Even if you bought your iPhone from the Apple store and it’s unlocked, it still won’t work in Hong Kong. iPhones bought in your home country are “unlocked” for a specific region only. You’ll have to either get you iPhone unlocked in Hong Kong for use all over the world or buy a world-unlocked iPhone in Hong Kong to get it to work here. So that’s the end of my long list of Hong Kong travel tips. There’s a lot of good information here for travellers. I hope you’ve found something useful here that’ll help you out if you plan on visiting Hong Kong. Again, I’d like to state that this is not a comprehensive list of Hong Kong travel tips. This subject is very broad and will always be open to editing and adding to the list. If you know of any Hong Kong travel tips that aren’t on this list, please contact us with your tip. Your very own Hong Kong travel tips may help out many travellers visiting Hong Kong! 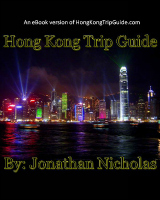 Buy the Hong Kong Trip Guide e-Book Today!